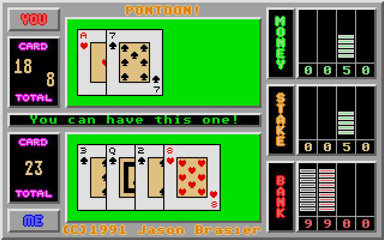 Pontoon is a card game, similar to Black Jack, where you play against a dealer/banker. The aim is to beat the banker's hand by scoring no more than 21, using no more than 5 cards. Of course, there's the special hands like Pontoon, which is 21 using just two cards, that beat any other hand (unless the banker has Pontoon as well), and a five card trick, which beats everything except Pontoon. The aim of this game is simple... bust the bank. Note that the download only contains the source files and is not supplied in an executable form. You will therefore need a copy of GFA BASIC 3 to run the game.